WOW! I did not see this one coming. 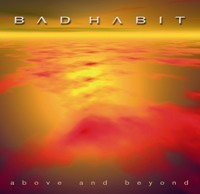 The music of the Swedish rock band BAD HABIT has not done much for me in the past but this brand new album could very well change everything. ‘Above and Beyond’ is the title of this hammer AOR release packed with songs so catchy that you will find your self humming their songs in the middle of the streets. So catchy that you will throw every single one of your AOR CD’s out the window and just keep this one. Yes, this band knows how to deliver catchy riffs and with singer Bax Fehling on top of it all with a voice of pure gold, you don’t go wrong here if you’re a genre fan. Well... there’s not one crappy track on ‘Above and Beyond’ in my humble opinion and the crystal clear production done by Jonas Reingold adds that certain thing that make the songs sound even better. This is the melodic rock album to beat this year so order your copy right now.